Yesterday I painted this larger version of Valley of the Five Lakes. I guess that makes the first little one a study? That first version is one of my favourites. It records such great memories and I love the colours and looseness. 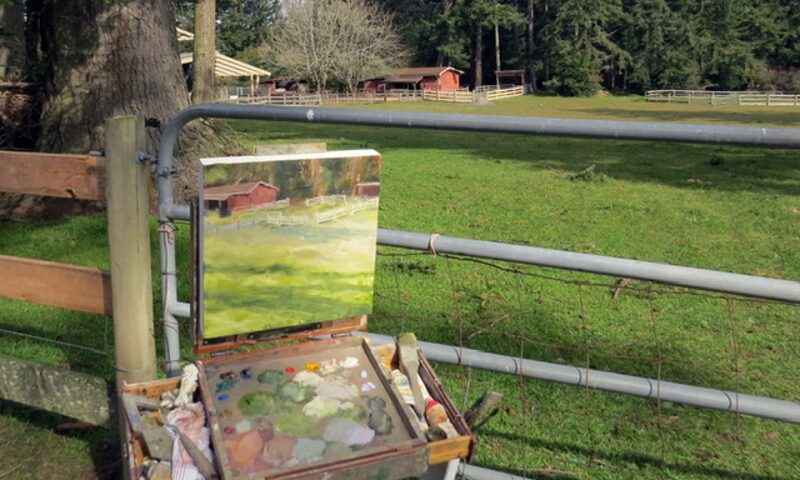 However I am still just learning to paint landscapes and in my mind was the question of whether the first one was a fluke. And while I still prefer the first, the second was a more conscious learning experience; colour matching, atmosphere as the greenery recedes and the mountain appears and capturing the light on the creek water. I also noticed a style of mark making occurring which I had used naturally in another of my favourite paintings (below – that one was done en plein air). Is this me developing a style? It definitely feels natural and yet I am learning through practice and by looking at the work of others who I admire. I am coming to understand that a personal style is both nature and nurture. As I make my way out towards Sooke to purchase a yoga bolster to strengthen my ailing back (as per Dot, my fabulous physiotherapist), I pause at the stoplight on the corner upon which pro-lifers have been camping on and off for years. Kitty corner from the Women’s Health Clinic. Today I realize that the group has grown in numbers and there are now two sides to the camp. There is no distinct separation between the two so I read each tattered cardboard message to identify where the shift occurs. Whereas I would normally avert my eyes in avoidance of those shaming messages, some of which display images not safe for the whole viewing family, I am now bolstered by reading messages of strength, voice and choice. Phew, what a relief! I toss the right side (shouldn’t that be left?) of the camp a pro-choice thumbs up as I make my left-hand turn and continue on my way. Backing up in time to before I got into the car to make my way towards Sooke past the more balanced dialogue-on-the-side-of-the-road, I was witnessing another life and death discussion in the form of one of my guilty distractions (I dare not call it a guilty pleasure); the Jodi Arias sentencing trial. A verdict watch is on and the jury has apparently come to an impasse in their decision to give Jodi Arias life in prison or death for her vicious murder of Travis Alexander. The interwebs is all-a-buzz with Twittering characters and spouting reporters salivating at the possibility of a verdict. But no, it is just some questions and legal words of encouragement from the judge for the jurors to go back and closely examine those areas which are of particular contention in an attempt to come to a decision. Don’t put aside your personal beliefs but be open to listening to the other side’s reasoning. Listen carefully to identify where the shift occurs and see if you can’t shimmy yourself over that line. We don’t want a hung jury. The woman in the yoga supply shop lets me in on the secret of how she can put her own vertebrae back into place using this hard foam roller. Only $52.00. I don’t think I’m quite there yet and opt for the bolster I came for. I will lay my spine vertically over it on the floor to stretch those teeny tiny spinal muscles which are causing me such pain. I will be careful not to tilt too far to one side or the other. In this case sitting (or rather, laying) on the line is encouraged. 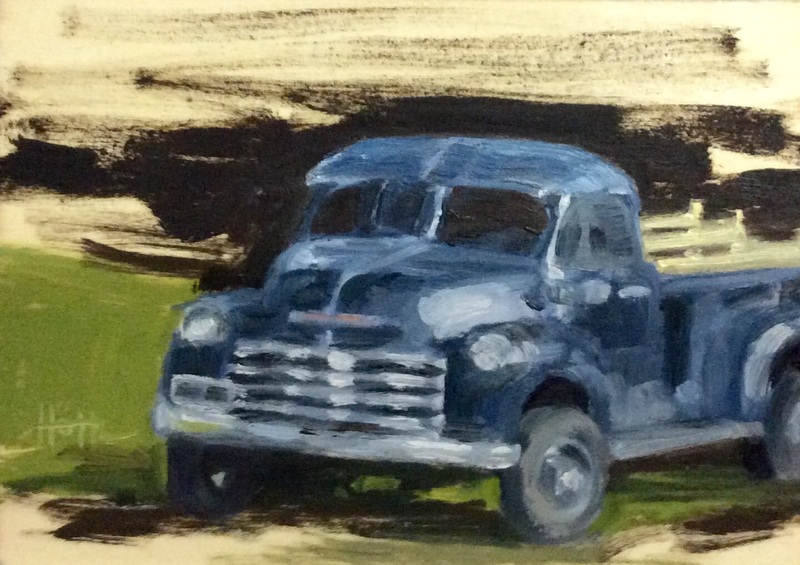 Backing up in time to this just past lazy Sunday afternoon, I created this little painting of an innocuous old truck. Sometimes it’s nice to just paint a truck. I am fortunate enough to enjoy my profession and to make art on the side. My husband Andrew is less satisfied with his profession and wishes he could go back to art school and we both would prefer to make a living with our art but we understand the finances of that choice is not something we have agreed upon or figured out. While we negotiate these waters, we still do make art. I am more prolific but less of my work is “good enough” for gallery or sales while Andrew is more particular and detailed in his work and less falls into the recycle bin. We are different and yet we struggle with the same issues. 12″x12″, studio oilt and yet we struggle with the same issues. 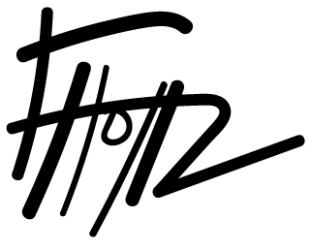 The question is, how to live (and retire) as a full-time artist in a society which does not value art as a profession but rather as a commodity after the artist has expired (and even that is rare)? We have a mortgage rather than rent. We save and invest towards retirement rather than winging it. And we still are artists… on the side. All the while, we wish we were full-time artists. I suspect this conversation will continue until my last gasp. Or am I not investing enough time and effort into figuring it out? Am I too afraid of a less stable life? I am determined to not let my choices stop me from making art OR making a living. I will make art regardless of my financial and societal situation. That is who I am. I believe that is not a choice.